Hidden Ginger in container w/ Vinca? Hi! I am a newbie! Trying to start a container garden here in NC! My question is I purchased just some "pretty flowers" and put them in a pot together. The container has a Hidden Ginger, some spike dracaena and a few Vinca. I've done a little research on the hidden ginger but I can't find anything on planting them with other plants in a container. I repotted everything 2 days ago in a large pot but now I am wondering if I should be kept the hidden ginger by itself...?? Can you tell me if I have made a mistake planting them together and need to separate the hidden ginger or if it will be okay as long as I provide sufficient space as they grow?? I don't want to kill it!! Comments for Hidden Ginger in container w/ Vinca? 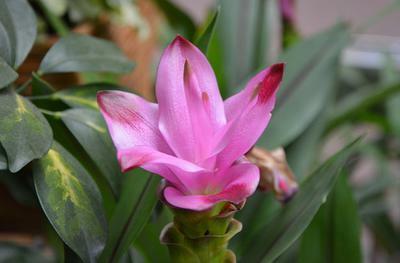 Hidden ginger, or Curcuma elata and other species, grow the flower first, before their leaves. Hence, hidden. They go by various other whimsical names, like Hidden Lily, Siam Tulip, Jewel of Thailand and Queen Lily. They are a rhizome, so if you plan on keeping it indoors for winter after it flowers and the leaves emerge, you will need to dispose of the other plants (move everything into other pots) and then let the leaves ripen, die down and then you can remove them. In the spring, just start watering again, and the flower stalk will emerge again. Overwintering this type of bulbous plant is a bit tricky. This is due to the fact that they require some kind of ripening process, usually a dry dormancy later in the summer and fall. This might not be possible with a mix of other plants that might need regular watering. More on Dave's Garden Website about these fascinating plants.